Some things are best done in company. 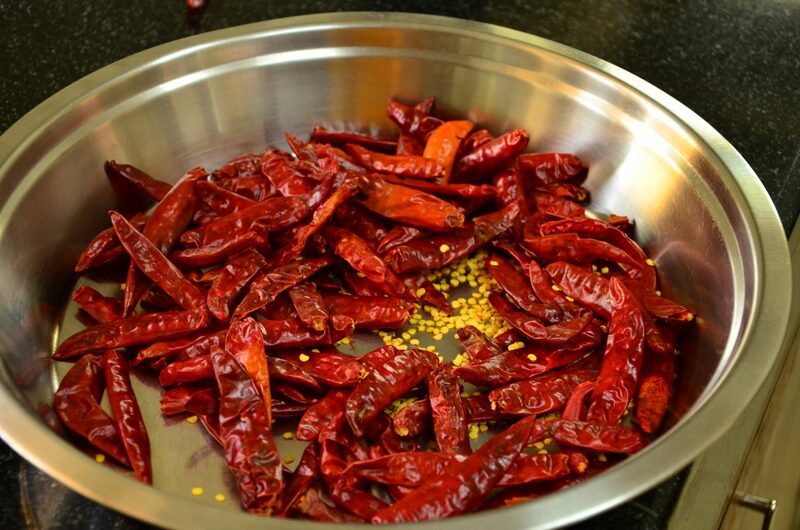 When home, one such activity is the preparation of ‘Do Piaza Laal Mirch‘. 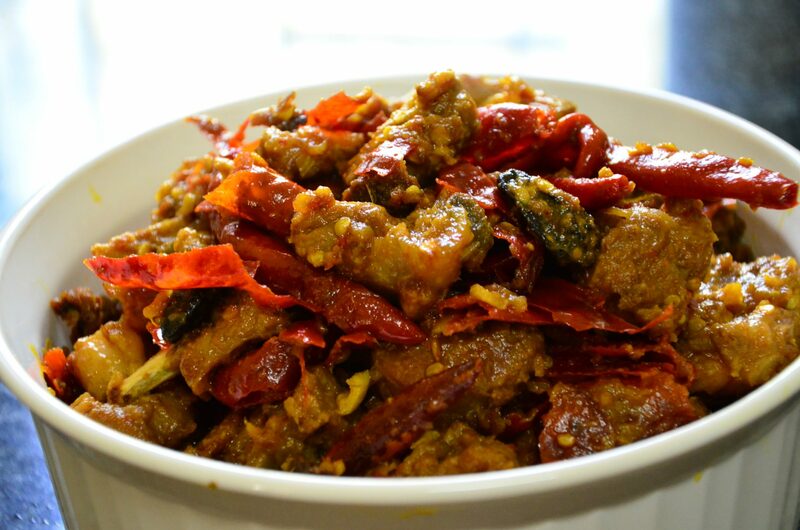 This delicious gosht or mutton dish has been prepared by my father for many years. Needless to say, my love for food and my fondness for experimenting with traditional recipes is derived from my parents passion for all things delicious. Do piaza laal mirch was introduced to us by Papa, who read the recipe in a book and diligently wrote it down in my mother’s recipe book. The green diary, worn, discoloured but intact is a treasure trove of memories. Flipping through its pages one can trace the story of a woman’s nurturing thoughts and a family’s likes and dislikes. In this new year, I share with you this delicious family favourite, originally written and published by Digvijay Singh of Sailana. Sailana is a town in the Malwa region of Madhya Pradesh, close to the state’s border with Rajasthan. This part of the country once had numerous principalities, Sailana being one of them. The first and foremost connection to food is always flavour. If those stand out and appeal to your palette then that’s all the connection one needs. For our family there is another link. My father, who loves to cook this dish, spent his childhood in Madhya Pradesh. His father had moved to the state while it was still being settled after the chaos of partition and eventually became a career bureaucrat retiring in Bhopal. Fast forward 30 odd years and as a young army officer my father was posted to the splendid desert city of Jodhpur. So smitten were my parents by the plae and its people that we called it home for close to 20 years. If you have heard about Marwari cuisine, especially of the Rajputs, then you’ve probably heard the mention of Laal Maas – a spicy, red mutton dish, very similar to the Gosht Do Piaza Laal Mirch. From his childhood to ours the thread of mingling with locally royalty and cooking recipes inspired from their kitchens continued bringing us to the present, where I often cook the same recipe in my small apartment kitchen in the US. Read on for a simple recipe with bold flavours. A little note of caution; as the name suggests, the mutton will turn out to be fiery and some teary eyes and runny noses will be seen. Serving Size: for 4 persons. To begin wash the mutton. In the Indian subcontinent gosht refers to red meat, most commonly, goat and lamb. These are the most commonly used meats in this part of the world. If you choose, you can use another meat that you prefer. In running water gently massage and wash the meat and leave it in a colander or a large strainer to drain. Now for the red chillies; slice them and remove all the seeds. My father was extremely cautious and used gloves! 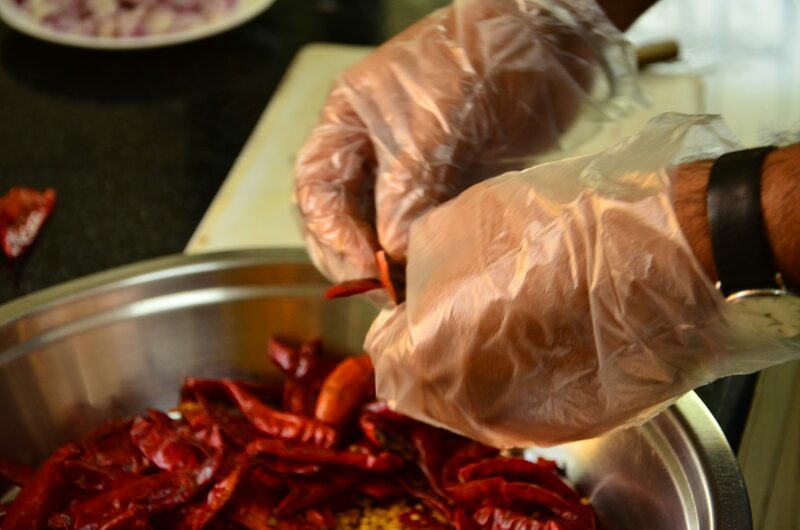 Incase you don’t have a pair handy, make sure you wash your hands and fingertips thoroughly after cleaning the chillies. Wash the chillies in running water and keep aside to drain. My father at the helm of preparations. Next take a large wok, put it on high flame and add ghee to it. Once the ghee is warm, add black cardamom and cumin seeds. Within a minute or so add all the chopped garlic. Once the garlic starts browning throw in the sliced onions. Fry them until golden brown. Finally, add meat. 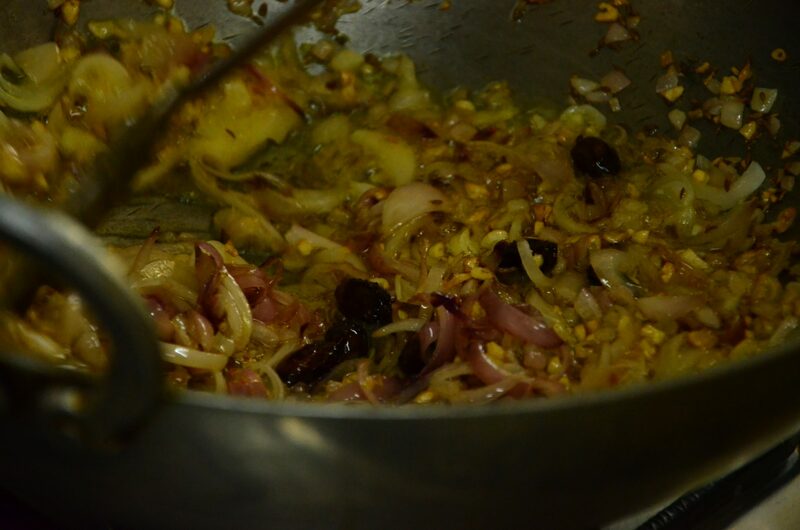 Mix it well with the ghee and onions, such that all of the pieces have been covered with the mixture. In a bowl beat together curd and all the remaining ingredients i.e. 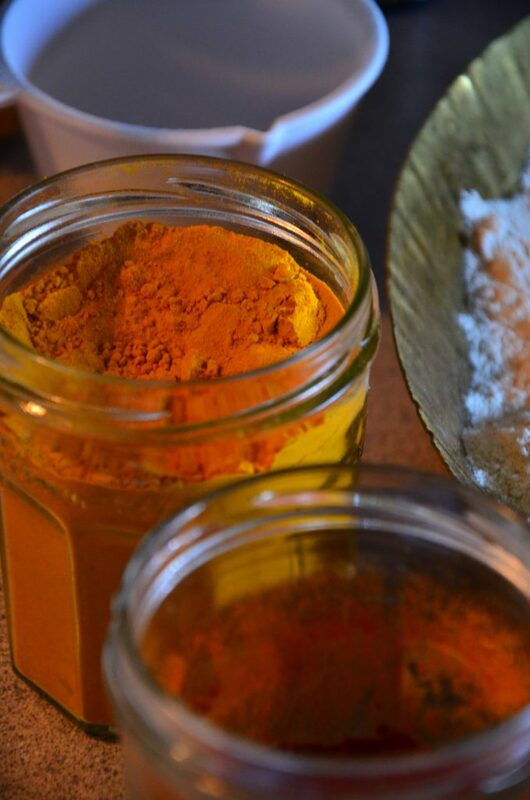 the coriander powder, salt and turmeric. Pour this mix over the meat and mix it well. Add only as much water that it dries up when meat is tender. 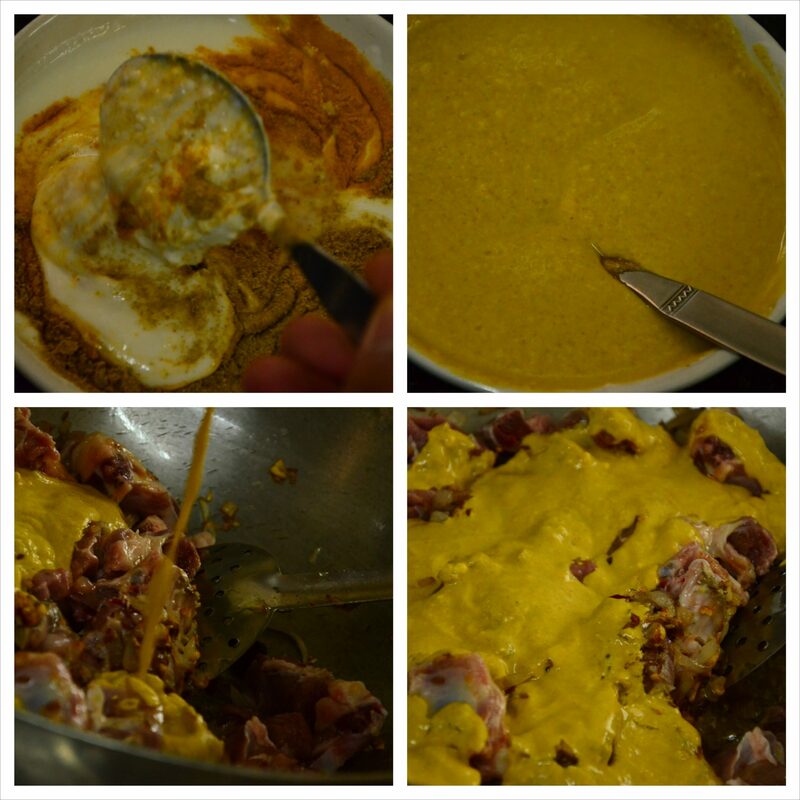 Clockwise from Top Left: Ingredients for the yogurt mix; stirred and combined; added to the mutton; coated and ready to simmer. 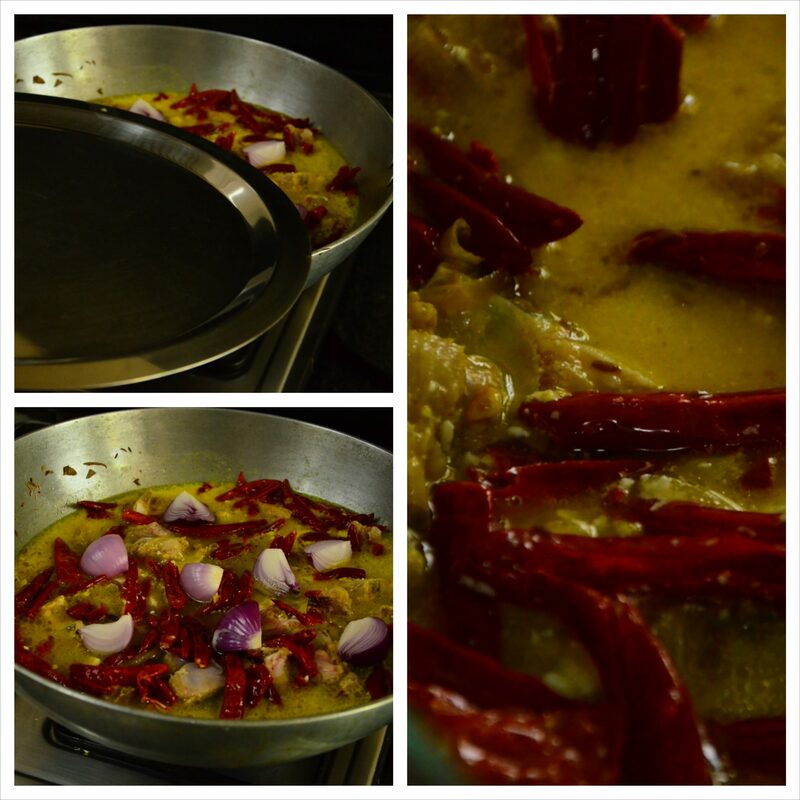 Add cubed onion pieces and all the whole red chillies on the top, then cover the wok and cook on medium heat. Keep checking every fifteen minutes. Add chunky pieces of onions before covering the mutton. When a little water remains, reduce the heat and simmer till all the water dries up and only ghee remains. Garnish with fresh coriander and serve with warm chapattis, naan or tandoori roti. 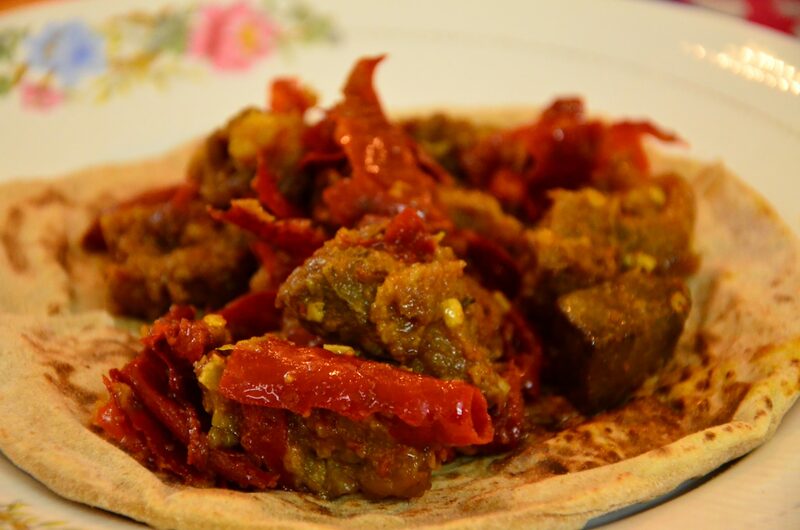 Our preferred method is to heap mutton on a chapatti and then break small bites from another chapatti to scoop up the meat. By the end of it the bottom chapatti soaks up all the fat drippings and moisture. Rolled up, it is a delight to eat! The work and collective effort put into creating this dish has ritualistic qualities and for me will always remind me of the times we have spent cooking and devouring it as a family. Keep cooking and making new memories.